You can scroll to the end of this post and comment or ask me anything. If you are referring to a specific entry, please make it clear which one---including the date is the easiest way to do that. The only rule: I won't post spoilers. 2. Zeep A book for 7-10 year olds. I have written it twice and am now, I think, on the right track. and am writing it in little bursts when I can fit it in. It's FUNNY, which is SUCH a relief from the politics and pain in the Resurrection of Magic books. 3. Free Rat: YA/adult A boy who won't tell me his name living in a near-future timeframe. I am beginning to think he doesn't have a name. He is in a facility where the nights are sometimes endless. 4. A Virgin's Blood: a medieval medical/political YA/adult thriller. Probably next up. Or maybe Free Rat. 5. Dickens and Fob an animation project--or maybe a book idea? All hot air and a detailed proposal at this point but I LOVE the premise and the characters and early responses are encouraging. 7. Oddlets; a funny and oddly structured little story intended as an ebook series, with enhanced reading stuff built in. It is with someone now who will tell me whether or not I should keep fiddling with it. 8. http://russet-one-wing.blogspot.com/ a free, twitter-format online novel that I haven't added to in well over a year. But I AM adding to it at home and will post a monster chunk ASAP. Paying work has to come first for now...!!! 9. Limori short stories, for YA/adults, will be listed during the production-wait for Book three. I worked late last night, so am just now writing the first new update. It 7:15 am Pacific standard time, California, USA. Resurrection of Magic ate up the whole day yesterday. Sadima's story stalled so I reread (and revised) about 20 of Hahp's chapters. Now, today, after a long time in Sadima's story, I am ready to switch back to Hahp's. I will likely write his half of the story until it falters, then switch back to Sadima. This has been the pattern since the first book. It will be interesting to see if it changes as the time lines become concurrent. The stories were about 200 years apart in Skin Hunger. That narrowed to about fifteen years apart in Sacred Scars. Now, the stories are only a few years apart. In the fourth chapter of book #1 Skin Hunger, Hahp is being taken to the academy, flying over the city in a carriage, looking down at his father's amazing Malek Park, the copper roof on the Eridian meeting house, etc. What he saw was the city and the time that Sadima is living in now. So today, I come back to Hahp's story. The students' isolation from the city of Limori and all that is happening there is complete. They are not aware of the unrest. They can't even guess the season. They can only estimate how long they have been in the cliffs by gaging their own physical growth. Hahp knows they can't even be sure of that, really, because the wizards can and do distort...everything. So, that's where I start today. If I stall out, I will move on to Zeep. It's always a leap, emotionally, to suddenly be attending third grade with a girl who celebrates Grander Mander Dilla Day with her family. And a relief, sometimes. "Ok, ok, I know it isn't polite to stare, but what IS polite, really. Even if you are talking quietly and nicely, once in a while you will burp in the middle of it. Or worse. Everyone does. Even our principal. I know that because I heard her once. She pretended it was a cough, but it wasn't. That's kind of like lying, isn't it? " From about noon on, I worked on A Resurrection of Magic #3. I began the day with Hahp's strand, then, hours later, opened all of the existing 55 files. I make one for each chapter, each with a title summarizing what's inside. This directory and its skeletal reminder of story points saves me a million hours of rereading. Staring at the directory, thinking about all the things that are upcoming,it seems like the time line can converge earlier than I thought. So that's where I will begin today, making sure I can do that before I go on. Skin Hunger was 64 chapters long. 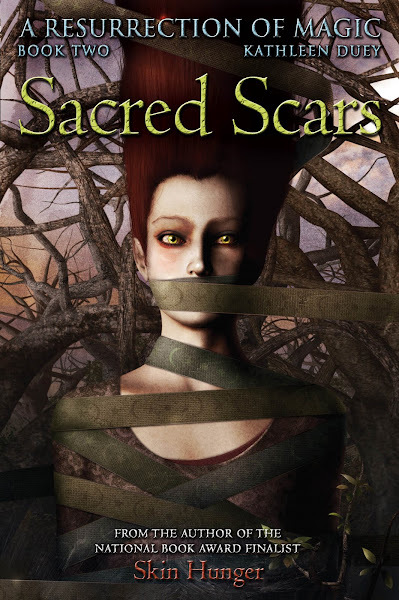 Sacred Scars was 71. All I can say is that the third book is at 55 chapters and there are no endings in sight. Sadima is still standing alone in the dark when she hears the voices. 10:25 pm PST and I am going to bed after a fabulous, amazing day of writing. I began the day with Dickens and Fob and learned a great deal about a Roman building that is buried beneath a theatre in London. The cast for this story is really interesting to me. Some are kids, the rest are all kinds of things. Then at noon, I hit the Big Book--#3 in A Resurrectuion of Magic. I went through 20 chapters, condensing them into 17. Yay! Tomorrow I ought to be able to fly straight ahead again. Rewriting, I heard the all the voices more clearly,too. I think I have been trying to interfere with them lately, trying harder to add pages than I am trying to hear the story. This is a revelation I have had, like, a hundred times and will have again. It's always a mistake for me, to actually write the story instead of listening for it. ...there are other people in Market Square now, speaking to crowds, referring to the magistrates as "The Ferrinidies magistrates" which is true, most of them ARE the descendants of the old kings--but that reminder is stirring up the old hatreds. Sadima and Hahp are both alive. Sadima has lost something that anchored her...and that worries me. Hahp is trying to recover his hope. And I am going to bed! Good morning everyone! I hope all is well with you and your beloveds. Sadima spent the bright fall days that followed walking the streets of South End, staring down the crowded alleys, passing the guards as if she carried no secrets, no fear. She looked into every face, every shop window, and tried so hard not to hope--then cried when she stopped hoping. By the time the first snow fell, she had no excuse, no choice. It was time to go back. This should be an exciting day of writing. Her decision is not the one I expected, but almost every kind of love scars the heart. As I wrote the scenes that followed her decision, I realized it is the same decision we ALL have to make. What matters? What matters most to you, to the ones you love, and to the ones you will never meet? Limori is tense, scary, balancing on a knife edge as powerful people wrestle for more power. The men and women on their way to work, opening their shops, the elderly people stealing food and a blanket for the night, the children who live under the boardwalks in South End, the fortunate sons and daughters of Ferrin Hill, scared that they are not allowed to go into Market Square without hired bodyguards now...everyone is wary, waiting, hoping. So. Back to today's work. Sadima can't run away from any of this anymore... and neither can I.
I spend some of each day rereading sections of the first two books...often at random. I almost never read any of my books once they are published, because I see too many things I would tweak a little, or re-write completely. But there are so many details in A Resurrection of Magic, so many tiny threads to weave, that I have to reread as I write. This morning I reread Sacred Scars Chapter 25, which is Hahp trying to recover from a surreal test that leaves him unsure of...everything. Because I understand Somiss's intent with every test, I know why it is important for Hahp to lose--and then recover--himself. The physics and the psychology of real magic, the cost of learning how to break all the rules, how to do things that are impossible--fascinates me. More Parkour, which began in France, but has gone worldwide. And today Hahp begins to learn how to walk through stone. I basically understand what would be necessary on a molecular level....it's the belief that it would work that will be the hardest part. Magic (and wingsuits, and roof leaping) require belief, first and foremost. Belief that it can be done. Sadima is on her knees in a forest, staring up at the cliffs. She is crying, but beneath that, in her deepest, heart, she is relieved, glad--and ashamed. Hahp is standing in a dark tunnel, watching the impossible. Gerrard's hands on his shoulders, pinning him, holding him back. Late in the day yesterday, I wrote a scene in Sadima's story that rattled the windows. It went entirely differently than I thought it would. So today will begin with her strand of the book again, so that I can see if she meant it, if everything hereafter needs to be painted differently than I have been assuming it would be. I am almost positive she is not going to rethink this. Today is the second day of condensation...of Sadima's strand. Not cutting content, just saying it in less words...because she needs to catch up, to be in the right place at the right time. Sometimes just being there...really matters. I am still condensing, looking at the time lines and checking continuity issues. All of this rereading is generating a lot of character revelations. They are not so much talking to me as screaming at me. Sadima is torn between doing what she must and doing what she wants. Late last night, I wrote a pivotal scene, one that made me cry. The courage, the bonds between the boys inside the cliffs--the trust they have managed to build in that insane place...just hit me. There have been classes of boys in that rat-maze of tunnels off and on over many centuries. The magicians of old often stole children from the streets, and sometimes from their homes. Somiss was the first to involve the sons of wealthy families, often families who were once royalty. He is building alliances, of course, and readying for a war he knows will come eventually. The difference between Somiss and all the magicians who came before him is fundamental. They wanted to protect their knowledge, their libraries, and their influence for the use of those who would follow them--even those with grossly extended lives knew they would die one day. Somiss has other plans. 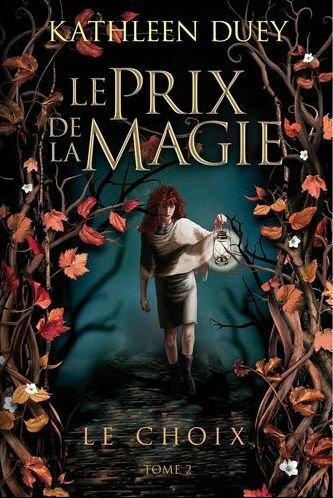 I'm so very excited for the new Resurrection of Magic book to come out. These updates are the best sort of tease! My daughter is a huge fan of the Alida books... and we live in Estes Park... and she loves historical fiction... so I can't wait to tell her about Faerie Creek Ranch!!! Stephanie, thanks so much for the lovely message and for putting up with the delay. Sarah--I love hearing that your daughter likes my books. 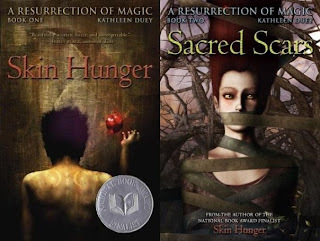 I have had such FUN writing them-both series are really dear to my heart. If you email me your address at kathleen duey at earth link dot net and give me her first name--I have book plate I can send.....!? @Cabri You are so kind!! Thank you! Which of the YA projects intrigues you most?? ‎"Mainsteam publishers are down on historicals just now"
This comment surprised me, as Alvina Ling said she and several editors she knew were looking for historical fiction. Of course, that was last summer but I'd hoped it wouldn't swing away again that fast! Now that you say it, I remember Alvina's remark in FL... and really being happy to hear it. I LOVE historicals. I love researching and writing them. I am mostly hearing the reverse, though. Anyone trying to gage the market for any genre can only base their guess on whatever they see and whatever they hear from their circle of agents/authors/editors and publishers. So no one really knows. I just had the great privilege of blurbing Cleopatra's Moon for Vickie Alvear--a fabulous new historical. There has been MUCH downsizing and upheaval in NYC and everywhere else. Publishers are adjusting, finding ways to address the changes. One of those responses seems to be a further-increased focus on commercial projects. But that's just me and it won't be forever. Cycles CYCLE! YAY! Candy, hello! If I ever wrote real spoilers no one would ever speak to me again. So I am VERY careful! That is the hard part about coming to your blog finding out info without really finding out anything at all. :) I can't wait to find out what happens in the last book...and yet I can wait all at the same time. Jenn, well, said. It feels like that to me, too. Bitter sweet. I have been living in Limori for a LONG time and I will miss it. Cabri, those are my two favorites. Free Rat was my second idea for a novel. (Resurrection of Magic was my first one, both put aside because I could,'t pull off either one back then.) A Virgin's blood is a recent idea that really captivates me. Thanks for these updates. I love reading them. You do such a wonderful job of capturing the spirit of what you're working on and intriguing the reader without giving any real spoilers. All your projects sound fascinating, although I am especially anticipating book 3 of A Resurrection of Magic. One thing that I wanted to mention is that small to medium-sized publishers are often not as driven by trends and commercialism as the large publishers. There are some potential problems to signing with a small publisher, but there are some potential advantages, as well. Often you can get a passion and personal attention with a small publisher that you can't get with a big one which has thousands of projects in the works. Not all small publishers are good, though, so you really need to do your research. Thanks for the kind words about the updates. I think you are right about smaller presses,and the truth is that different writers are happy in different settings. It's all about finding a good fit and the best "partners" for the book. And, as you said, do the research, especially if you are working without an agent. Writers can nearly always find ways online to contact people who have worked with whatever publisher they want to evaluate.